Twenty-five years after the Octagon first appeared inside McNichols Sports Arena in Denver, Colorado, the UFC cage is back in “The Mile High City” to mark the occasion with a strong collection of fights featuring current contenders and a host of potential future stars. On that first night — November 12, 1993 — 10 different fighters crossed the threshold into the eight-sided cage in hopes of proving themselves to be the “Ultimate Fighting Champion.” Now, a quarter century later, 13 sets of high-level athletes will make the walk this weekend, chasing the same dream. While the top of the card features a host of familiar names, established contenders and former title challengers like Chan Sung Jung, Donald Cerrone, Joseph Benavidez, Ray Borg and Raquel Pennington, the real highlight of this event — for me — is the collection of up-and-coming talents poised to compete throughout the evening. There are times when finding three competitors to spotlight in this series is tough, but this week, the challenge is determining which newcomers and relative novices to exclude because there are so many to choose from. Recent TUF winner Michael Trizano, MMA Lab product Bobby Moffett and Thiago Moises could all hold down a spot on this list, as could Hannah Cifers and Davi Ramos, who won his last two appearances in the Octagon after dropping his short-notice debut to Sergio Moraes while fighting up in weight, but there just isn’t enough room. File those names away because you’re sure to see them discussed in this space in greater detail in the future, but for this week, here are the three emerging talents you should pay close attention to on Saturday. This is On the Rise: Denver Edition. “The Future” is a 20-year-old undefeated fighter with designs on breaking Jon Jones’ record for being the youngest champion in UFC history. 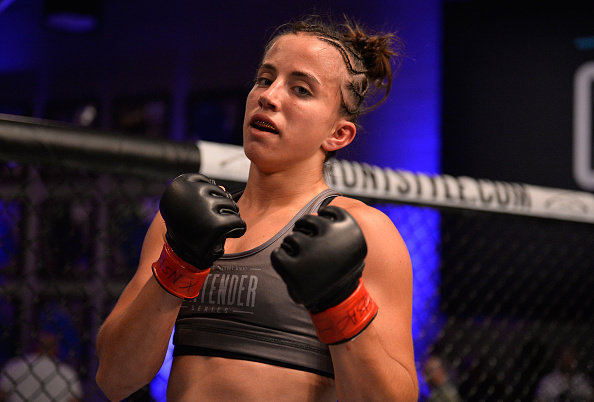 After her dominant third-round stoppage win over Jamie Colleen this past summer on the Contender Series, it’s difficult not to envision the driven and focused Colorado native making a serious run at the record books. Barber fights with a maturity and depth of talent that belies her age; there is none of the youthful exuberance that leads to a breakdown in form you would expect from someone who is still six months shy of their 21st birthday. She’s patient and methodical, confident that her abilities are enough to deliver her to victory without feeling like she needs to force things. Those attributes, which are difficult to teach, harder to learn, and crucial to long-term success, were on full display in her fight with Colleen. Although Barber quickly established herself as the superior fighter, she didn’t chase the finish or over-extend herself against the opportunistic veteran, who snatched victory from the jaws of defeat in her first appearance in the TUF Gym on Season 1 of the Contender Series. Instead, she stuck to the game plan, continued to press forward and secured the finish with a torrent of nasty elbows from top position when the chance to finish materialized late in the fight. Originally scheduled to face Maia Stevenson, Saturday’s bout with Cifers, a tough 26-year-old with twice as many professional fights and a five-fight winning streak of her own, will be an even greater test for the talent hometown favorite. If she can emerge from her promotional debut with another victory, Barber will take another step towards accomplishing her goal and hit 2019 as someone to watch in the strawweight division. While the aforementioned Michael Trizano won the lightweight competition on Season 27 of The Ultimate Fighter, the man who has garnered the most attention coming off of the UFC’s reality competition is his opponent this weekend, the unbeaten “Violent Bob Ross,” Luis Pena. These two were set to face off in the semifinals of the competition until Pena was forced to the sidelines with an injury, but after both registered victories on the finale — Pena making quick work of Richie Smullen and Trizano besting Joe Giannetti — it only made sense to pair them off and give the people the fight that didn’t materialize earlier. The 25-year-old Pena has shifted his training to San Jose, California in order to work with Daniel Cormier and the crew at AKA that coached him on the show, and he looked outstanding in his first appearance with the team, submitting Smullen in three minutes and change to push his record to a perfect 5-0. 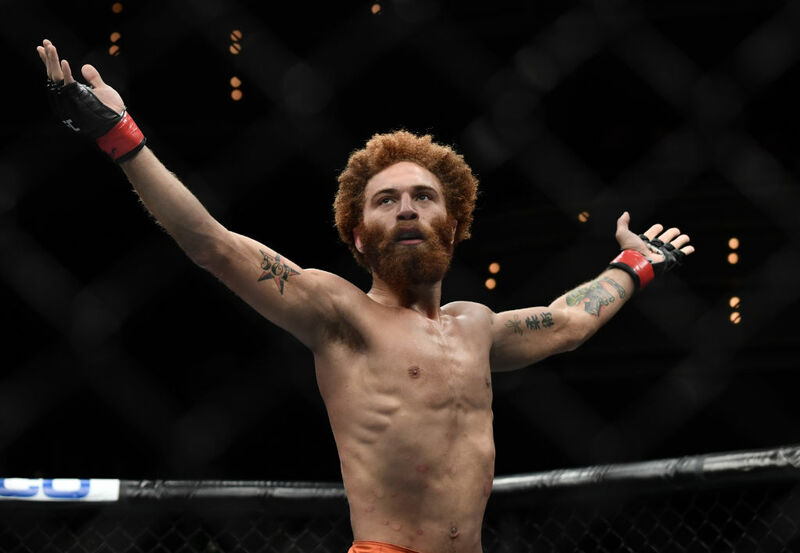 Sporting a bushy red afro and with incredible size for the division, Pena is an unmistakable and intriguing addition to the 155-pound weight class. Trizano is also unbeaten and trains with a great team as well, Team Tiger Schulmann, so this will likely be the toughest test to date for the instant fan favorite. Should he topple Trizano and become the lineal TUF 27 lightweight champion, don’t be surprised if Pena continues to garner main card opportunities and a chance to continue establishing himself as a newcomer to keep track of in the deep and talented 155-pound ranks. Fighting out of Factory X in Edgewood, Colorado, Smith was a late addition to Saturday’s fight card, but he deserves a place on this list after delivering an impressive showing this summer on the Contender Series. After earning a first-round stoppage win over UFC veteran Justin Edwards in March, “King Kage” arrived in Las Vegas in August and dominated the previously unbeaten Joe Lowry, showcasing lightning quick hands and sound finishing instincts in collecting the first-round stoppage win. In doing so, Smith not only pushed his winning streak to four, but he also earned his opportunity to compete on the biggest stage in the sport. Now, the 25-year-old lightweight will square off with returning former TUF contestant Julian Erosa, who also earned a victory on the Contenders Series this past summer. Factory X has been on a nice roll as of late and Smith has a real chance to keep that going this weekend. He’s looked outstanding since suffering the first and only loss of his career — to fellow UFC Denver competitor John Gunther — and a win over Erosa will not only validate his promotion to MMA’s major leagues, but set him up for greater opportunities in 2019 and beyond as well.